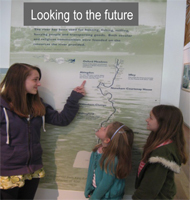 In 2010 the Museum was awarded a Lottery Fund Grant of £1.7 million. This was towards a project that was to cost over £3 million. The project involved extensive repairs and conservation needed to preserve this 17th Century, Grade I Listed building which houses the Museum collections. The funds were also to upgrade the facilities, re-display the collection in enhanced conditions and also to improve accessibility. An Appeal Committee was set up to match the Lottery Fund Grant. Over the last 3 years the Appeal has achieved its aims thanks in particular to the considerable financial support from Abingdon Town Council, Vale of White Horse District Council and Oxfordshire County Council. The Appeal itself raised a total of over £205,000 with donations from national and local charitable bodies, local commercial firms and very many local individual donations. The Museum Friends contribution came mainly from organised events which required considerable input from the membership. There were several Open Garden days, a Bun-throwing Raffle, a Postcard Art Exhibition, a Wine & Cheese Party, several Fish & Chip Supper Quizzes, a Literary Quiz and a Choir Concert in St. Helen’s Church. These events raised a total of over £8,000. The Friends have made a further donation of £3,500 from its Accumulated Fund. The Lottery Fund officers were impressed throughout by the commitment and achievement of the Community. Everyone involved can feel proud of a building and a museum which is such an important feature of the centre of the Town. The success of the project is now being shown by the considerably increased number of visitors and also by an increase in the membership of the Friends.